Meet Caroline Wesson. She attends the Georgia Institute of Technology and graduated with the IB Diploma from Douglas County High School in 2012. Caroline offers advice about choosing a university and talks about how the IB experience led her to pursue a degree in International Relations. 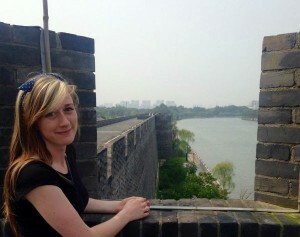 Caroline Wesson in Suzhou, China, where she spent her summer with Chinese high school students. What advice do you have for IB students who are beginning the university admissions process? Caroline: My best advice is for students to think about their studies – what do they enjoy about each subject? Deciding what universities you want to apply to – and ultimately which to pick – is based on your interests. Talk to your IB professors about the material that you found interesting and ask them what programs of study would best allow you to engage the material and apply to a future career. What other factors should students consider? Caroline: Additionally, think about things you want to do for leisure and what kind of community you want to be a part of. As IB students, and even as alumni, you will want to engage with and impact your surrounding community. For me, it was important to be located in a city – where I had plenty of service opportunities and a diverse community to learn from outside of the classroom. What are you currently studying and what led you to choose this? Caroline: I am studying International Affairs with a minor in Economics. I chose this area of study because during my studies before and during the IB Diploma Programme I found myself constantly trying to learn more about history and how it impacts governments, cultures, and the way in which different cultures interact with one another. I believe that my IB economics teacher created a desire for me to learn more about how different countries can interact with one another to facilitate both economic and human development. Have you had a great job or internship or research experience? Caroline: I have had the privilege to belong to an undergraduate program known as Grand Challenges that has allowed me to explore innovative solutions to “wicked problems” that exist around the world. I worked with a team that tackled developmental issues such as food insecurity and malnutrition in the Sahel Region of Africa. My team worked to develop an efficiency study to determine more effective and culturally accepted irrigation methods for this region. Additionally, this past summer I worked with Duke Talent Identification Program in Kunshan, China with gifted Chinese high school students. It was a wonderful experience in which I was given the opportunity to learn more about Chinese culture but also act as a role model and representative for American college students. This experience has inspired me to pursue a regional concentration of my academic studies in Asia-Pacific.